SketchBook Copic Edition is a great application capable that allows you to make drawings as simple or as complex as you want them. The tools contained in this application are definitely professional grade. 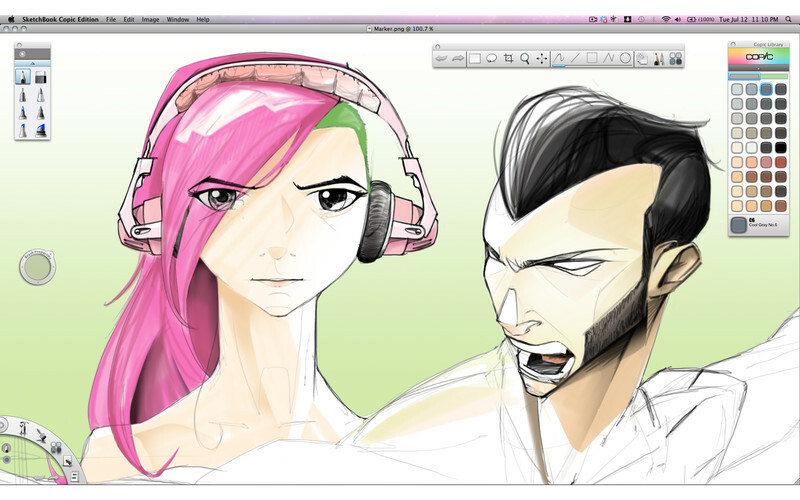 This application is designed to give you a taste of the Sketchbook Pro Edition, but does so by not costing you anything. While the tools are indeed beautiful, there are a couple odd limitations at play here. Sketchbook Copic Edition is a terrific application for those who aren’t familiar with professional tools, but would like a basic place to get started. Although this application is built for your Mac, it is designed from the ground up to be compatible with pen-stylus and tablet gestures. Features of this app include very high-quality brushes with 6 different brush tips and nubs, basic features like pencils and erasers, and 72 “copic” colors. These colors give you a good idea of what colors to expect in more high-end applications. Sketchbook Copic Edition includes great support for layers. You can add up to 6 layers in your drawing. This is great because it really gives you many opportunities to add depth to your creations. Another cool feature is that you can import your own photos to serve as a layer. This will allow you to incorporate real, live pictures into your drawings, which can lead to some very interesting outcomes. Although Sketchbook Copic Edition is a nice program, there are still some odd features that are lacking. For starters, the colors that they give are really kind of strange. They are by no means “typical” colors. So if you want a basic green or red color, then you are unfortunately stuck with just pastels. In addition, the transparency options are a little weird as it isn’t possible to make it more than 50%. These are pretty strange aspects which I expect to see fixed in a future update. 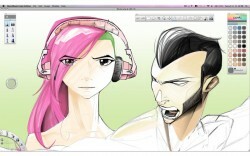 Overall, Sketchbook Copic Edition is a fantastic application… especially considering the fact that it’s free. It gives anybody access to powerful and professional drawing tools that were previously only found in professional products. Although there are some odd quirks, they don’t take away from the fact that this application can do much more than other drawing applications, free or paid ones. I can highly recommend this application to anybody looking to get into graphic design or other type of virtual drawing.